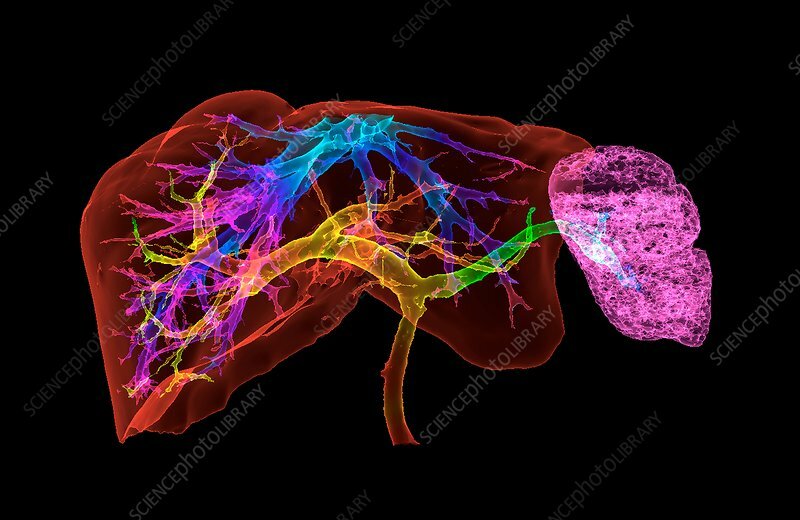 Liver and spleen and blood vessels, 3D coloured computed tomography (CT) scan. The liver (brown, left) is the largest gland in the human body. It plays a vital role in metabolism, storing nutrients in forms such as glycogen, and helping to clean the blood of toxins and other waste products. The main blood vessels are the hepatic portal vein and the hepatic artery. The spleen (pink, right) is part of the lymphatic system. It is involved in processing white blood cells (lymphocytes), and it also regulates the number of red blood cells in the bloodstream by destroying old cells.